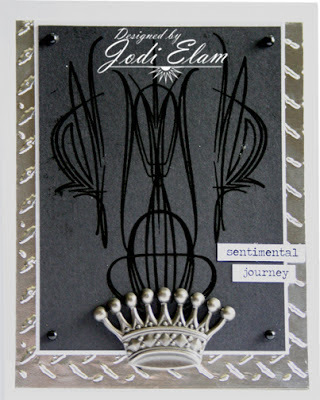 I grouped them together in a cool design and heat embossed them in black on black cardstock. I used the diamond plate embossing folder by Tim Holtz as well as that metal crown. The diamond plate is embossed on adhesive foil by Ranger. Tada - simple and elegant. You could use these pin-stripes just like a flourish - only more manly. Check out the other Muse Monday posted on the Bombshell blog and get inspired!